How to Link The Rear Wireless Speakers To My Blu-ray Home Theater System on HT-F Models? The wireless receiver module linking ID is set at the factory and should automatically link when both the wireless module and Blu-ray Home Theater System are powered on. However, if the link indicator does not light when both are on, or your Blu-ray Home Theater System has been serviced recently, follow the steps below to set the ID and link. 1 Verify that the Blu-ray Home Theater System is Powered OFF and the wireless receiver module has been disconnected. 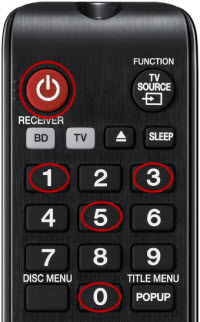 Prepare your remote by pressing the BD receiver button which places the remote in receiver mode. • If you do not set the remote to receiver mode the steps below will not work. 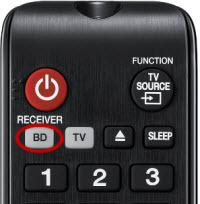 When the remote is in receiver mode, the BD receiver button flashes orange. 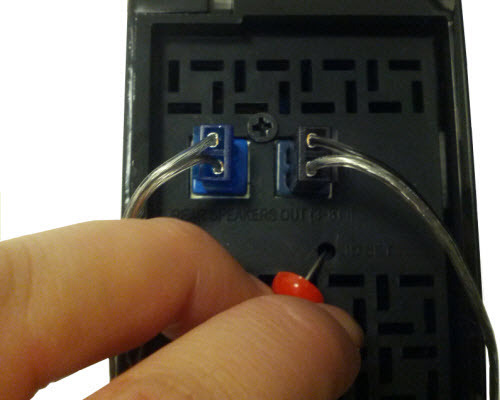 2 Plug the power cable of the wireless receiver module into a working outlet, and then using a small pointed object (paper clip), press the ID Set button for 5 seconds. The blue Link LED will blink rapidly. The Link LED will continue flashing for about 30 seconds, this is how long you have to complete step 3 below. 3 Using the number buttons on your BD HTS remote press 0, 1, 3, 5, and then the Power button. 4 The Blu-ray Home Theater System will then power on. The Link LED will continue to blink as it establishes a connection with the Blu-ray Home Theater System. When the Link LED turns a solid blue this indicates both devices are now linked. • If the wireless receiver module does not link, repeat the steps above. Be sure to check that the BD HTS remote is on receiver mode, press the ID Set button for 5 seconds until the link LED starts rapidly flashing and then quickly point the remote at the BD HTS and press 0, 1, 3, 5 and then the power button. The linking LED will go from flashing to solid once linked. You can also try moving the wireless receiver module closer to the main unit for linking purposes only, once linked you can place the wireless receiver module back. • When the Blu-ray Home Theater System is powered off the link indicator blinks and then the Standby indicator will turn a solid red indicating the wireless receiver module is powered off and in standby mode. • The transmission distance of the wireless signal between the wireless receiver module and Blu-ray Home Theater system is about 33ft., but may vary depending on your operating environment. If a steel-concrete or metallic wall is between the main receiver and the wireless subwoofer, the system may not operate at all because the wireless signal cannot penetrate metal. • If you use a device that uses the same frequency(5.2Ghz or5.8GHz) near the system, some sound interruption may be heard due to interference. How do I reset the software on my HT-D5550W? The password for rating level has been forgotten.